First, hold down the leftover black sheet in the cartridge and slip your desired instax film through the slit in the bottom of the cartridge. Use washi tape to pin down the instax film in place. Attach to your wall using a thumbtack, or stand them up on a desk or shelf. Fold a blank piece of paper in half and have your child write a special message inside. Take a photo of your child or have them take a selfie using the instax mini 70. Paste the photo onto the card or piece of paper using glue or washi tape. Afterward, let your child add an additional decorative touch with pens, markers or glitter glue. The more unique the design, the better it reflects their personality. Make sure to take your easy-to-use point-and-shoot camera with you on trips with your little one. Use the photos you take to create a collage from the trips you cherish the most. It’s a great way to relive those memories as your kids get older. 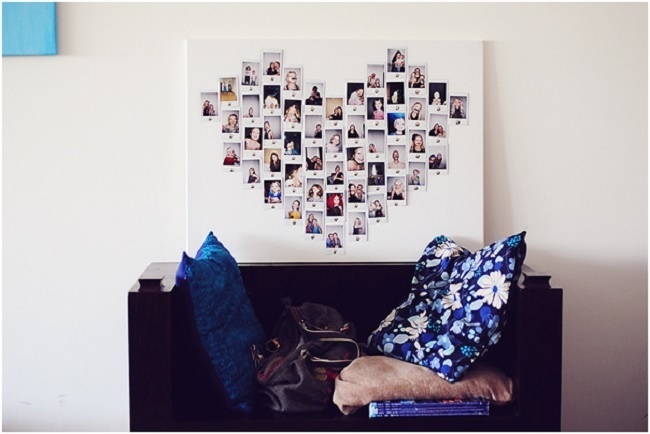 Take your favourite photos and arrange them around the paper in the perfect configuration. Use glue to stick your photos to the paper. Take a trip to your local craft store and pick up a large cardboard letter. Choose the initial of your child’s name or the family surname. If you’d like to give your cardboard letter a pop of colour, paint the exterior with acrylic paint. After the paint is dry, use washi tape or glue to adhere the photos on all sides of the letter that are visible. Then hang the letter up on your child’s door or in their room as a memorable design. Showcase your photos by making a memory-filled candle holder. It’s easier than you think, and costs very little. This is perfect for home decor or a homemade gift. Choose four of your favourite instax photos to display. Tape the photos down to each side of the candle holder. With a selection of kids art projects to choose from, your child will have a creative experience that will last for years to come. Happy creating!